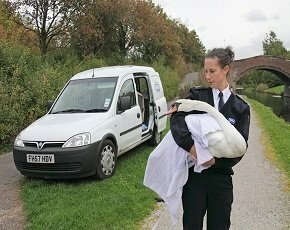 The RSPCA has announced a new partnership with AMT-SYBEX to help its officers handle animal cruelty cases on the move using their mobile phones. All of the incidents reported by the public to the RSPCA – estimated to be one every 30 seconds – go through its central command system, known as Tails. Until now, officers were informed of the incidents by a phone call and then had to use three separate mobile devices to carry out their investigation, along with filling out mountains of paperwork afterwards. The 400 RSPCA remote officers will now use a mobile app created by AMT-SYBEX to enable the charity’s control centre to update its officers via their smartphones, sending them information on newly reported incidents, enabling them to track activity on existing cases and giving them the capability to report back to base from their handsets. It also includes satellite navigation software to ensure officers can easily find their way to incident locations. The system is called Mice (mobile integrated communications equipment) and was developed as a bespoke product over three years for the RSPCA. It was developed to run on the Windows Phone platform, with the charity choosing Motorola smartphones for the officers. Trials of the software have already proved successful, with most new cases reported into Tails within 15 minutes. It has also cut the cost of administration due to the removal of paper-based workloads. “We have been working closely with AMT-SYBEX on the new systems and are delighted with the end result," said RSPCA chief superintendent Richard Harding. "Our workforce is now more mobilised in the field, making officers even more efficient in their roles [and] helping us to save more animals from cruelty and neglect. We asked AMT-SYBEX how much the contract was worth, but a spokesperson declined to comment.